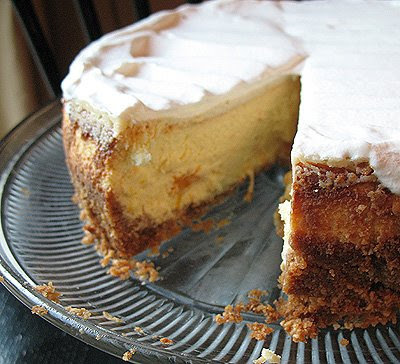 I have a cookbook called The Cheesecake Bible . I’ve been through it and bookmarked I can’t tell you how many recipes that I intend to try eventually. 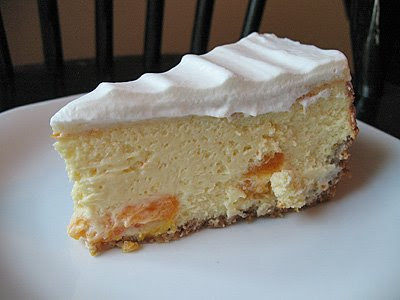 I LOVE cheesecake. 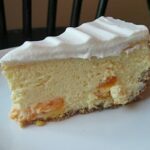 :) Well, I’ve had some canned mandarin oranges in my pantry for a while, and I love the flavor of orange in desserts, so I settled on the Mandarin Orange Cheesecake on page 122. This recipe is absolutely delicious! It was so good that I ended up giving the last three pieces away to a neighbor because I wanted some every time I passed by the cake plate! 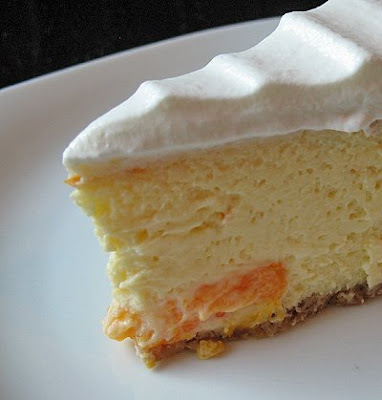 It’s creamy and full of orange flavor, any orange lover will adore this dessert. I did substitute drained yogurt for the sour cream simply because I didn’t have any on hand. It worked out just fine. I also used fiberts (hazelnuts) instead of almonds as that’s what I had on hand. Let me know if you try this, is is truly fabulous! Preheat oven to 350 degrees F. Prepare pan: 9-inch cheesecake pan, ungreased, or springform pan with 3-inch sides, greased. In a medium bowl, combine graham cracker crumbs, almonds, and butter. Press into bottom of cheesecake pan and freeze. In a mixer bowl fitted with paddle attachment, beat cream cheese, butter and sugar on medium-high speed until very smooth, for 3 minutes. Stir in sour cream, orange juice concentrate, orange zest and vanilla. Fold in orange segments by hand. Pour over frozen crust, smoothing out to sides of pan. Bake in preheated oven until top is light brown and center has a slight jiggle to it, 45 to 55 minutes. Let cool on the counter for 10 minutes (do not turn the oven off). The cake will sink slightly. In a small bowl, combine sour cream, sugar and orange juice. Pour into center of cooled cake and spread out to edges. Bake for 5 minutes more. Let cool in pan on a wire rack for 2 hours. Cover with plastic wrap and refrigerate for at least 6 hours before decorating or serving. In a well-chilled bowl, whip cream on medium-high speed until soft peaks form. With the mixer still running, sprinkle sugar into cream and continue whipping until firm peaks form. 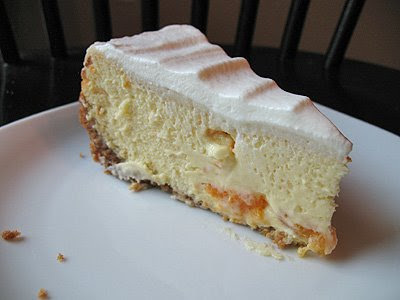 Ice top of cheesecake or pipe a border around cake, if desired.